In the Winter Driving School in Steambot Springs (Colorado, USA) the company Bridgestone made a presentation on the new friction novelty for the most severe weather conditions in wintertime. 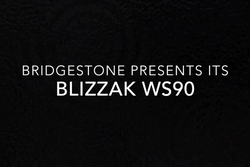 The Bridgestone Blizzak WS90 tires designed for sedans and minivans would be available on the North American market in May 2019. They are going to replace the model Bridgestone Blizzak WS80. The streamlined tread pattern, which ensures the greatest road-holding ability and sustainable steering throughout the corners. Bridgestone’s Blizzak WS90 at its Winter Driving School in Steamboat Springs, Colorado. According to manufacturer the Bridgestone Blizzak WS90 tire tread rate has been increased to 30%, therefore vehicle owners can boldly count on additional exploitation winter season. The assortment offer of the Blizzak WS90 model is represented by 51 dimensions that cover 86% of the needs of the target market. Bridgestone Blizzak LM25 — Run-Flat winter tires.